To celebrate 30 years, Lindsey Patchworkers held an exhibition of their work in the Cyril Turner Community Hall in Ludford. 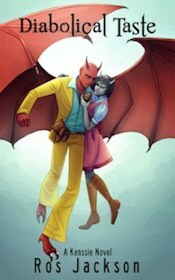 The show ran from 10am to 4pm on Saturday, and will be repeated on Sunday at the same times. It features the group's works, from intricate quilts to cushions, boxes, ornaments, bags, and an array of other creative and beautiful objects. 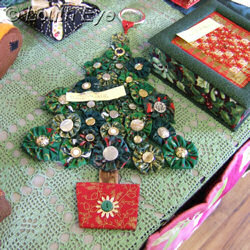 It also includes craft stalls, a tombola and refreshments. The event is helping to raise money for LIVES and Air Ambulance. 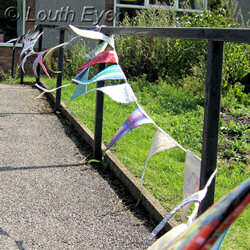 It's sponsored by the Lincolnshire Wolds Countryside Service, M &G Designs of Eastgate, and Boyes. 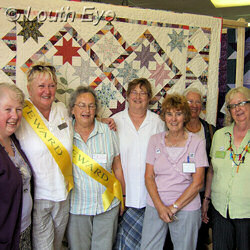 Sheila Evans, chairperson of the Lindsey Patchworkers, was pleased with the interest they've had. "We've had visitors from as far away as Wiltshire and Surrey," she said. Diane Frankish put together and quilted the quilt that the group donated to the Air Ambulance to be raffled to raise funds, but all of the members contributed squares. 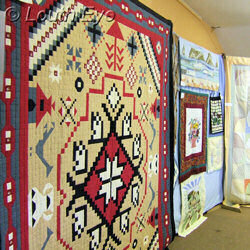 Likewise many of the items on display were collaborative efforts, such as a whole aisle of row robin quilts. They are made by each member contributing one row, then passing on the quilt to the next person to add something new to. The end product can be a surprise for the creator. 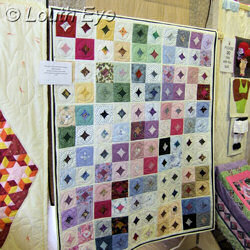 There were a lot of quilts on display, but nowhere near the group's total output: a lot of these end up as Linus quilts, which is a project that aims to give soft, snuggly comfort to sick and distressed children by giving them quilts and blankets to keep. Councillors debate whether the town should lend out its priceless artwork, and how many more houses Louth can squeeze in. Save Lincolnshire Libraries prepares to lobby MPs, whilst various groups fight for the future of the livestock market. 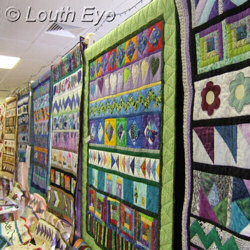 The Lindsey Patchworkers display their quirky and eye-catching handiwork at the Cyril Turner Community Hall in Ludford.